This tart combines the sweet chocolate cream flavour with the sweet-sour citric taste of the oranges. It is as easy to prepare as yummy!!! Prepare the short pastry: Sift the flour with the baking soda, place them in a mincer (you can also make it by hand) with the other ingredients and blend until the mixture comes together. Wrap the dough in clingfilm and refrigerate for half an hour before using. Meanwhile, prepare the custard (pastry cream) and let it cool. Take the sweet pastry from the fridge, roll it out on a lightly floured surface or if you prefer on parchment paper, use it to line a greased and floured rectangular mould (if you have rolled the dough on parchment paper you do not need to grease). Using a fork or a pastry docker, prick the bottom of the dough all over (pic. 1), cover the bottom of the dough with other parchment paper, spread with dried beans (2) and place in a preheated oven to 170°C (340°F) for 30 minutes. Rinse the oranges, slice them into thin slices and arrange on a baking tray lined with parchment paper (3), pour liqueur, sprinkle with sugar and grill until they are caramelized. Take the dough out of the oven, remove the paper and beans, allow to cool. 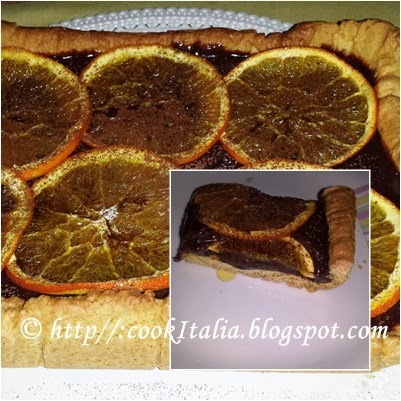 Fold the nutella in the pastry cream until completely incorporated and spread it over the bottom of the baked pastry shell, place the caramelized orange slices on the cream, sprinkle with cocoa powder (4) and serve.